The festive season has started form this day,THOLI EKADASI..Ladies will be busy from now onwards because this is the day from which poojalu vrathalu and pandagalu are started.Sravana sukravarm, Sravana mangala varam,Vinayaka chaturdhi,Dassara,Divali etc etc. For diet conscious and those who do upavasams(fasting)here is a small variety of prasadam which can be done easily..
Should be fried till brown in a tsp of ghee. Place a pan on the stove add 1 tsp of ghee and roast semya till brown,remove the semya in to one bowl.Next again place the pan add 1tsp of ghee and roast ravva till a little brown,then remove in to another dish..
Now place the same pan on the stove and add water,when it starts boiling then add semya to the water and cook slowly in low temp,after it is cooked for 10 to 15 mins in low temp,then add the milk to this semya mixture.Coz semya needs more time to be cooked. When it starts boiling slowly add roasted ravva and mix well.While mixing add sugar,and let it cook in low temp.Lastly add ghee and elaichi powder,and fried cashews and raisins. Let it simmer,and switch off after it is done.The consistancy of this prasadam is semi solid and soft. This is the normal method.Normal people can use a little more sugar,milk and ghee .But diabetics u can do prasadam by still lowering the usage of sugar and ghee .You can offer this prasadam in your puja,and replace the meals in your Ekadasi upavasam(fasting). 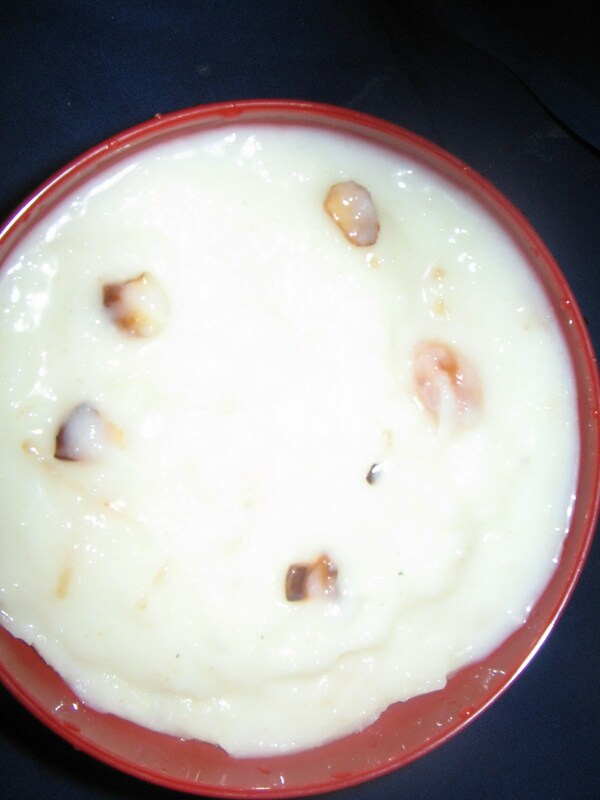 Thats a droolworthy payasam,looks very yummy and creamy..